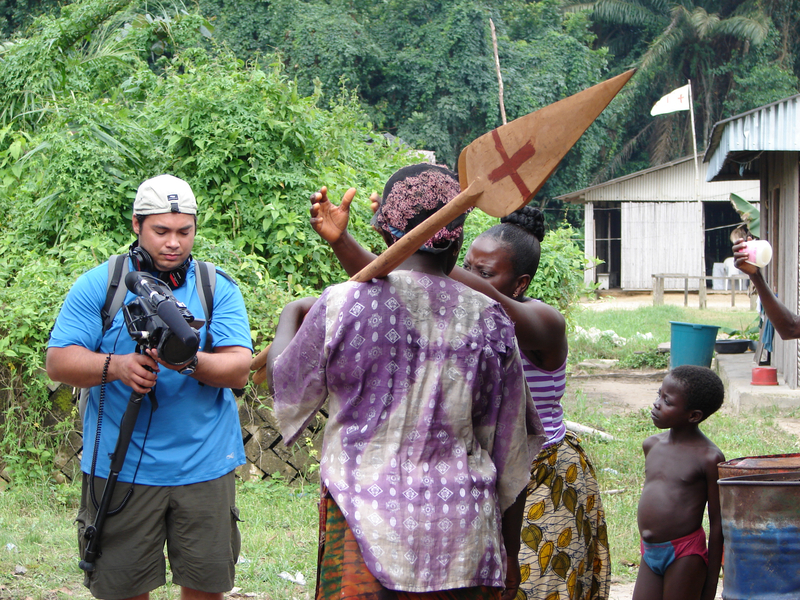 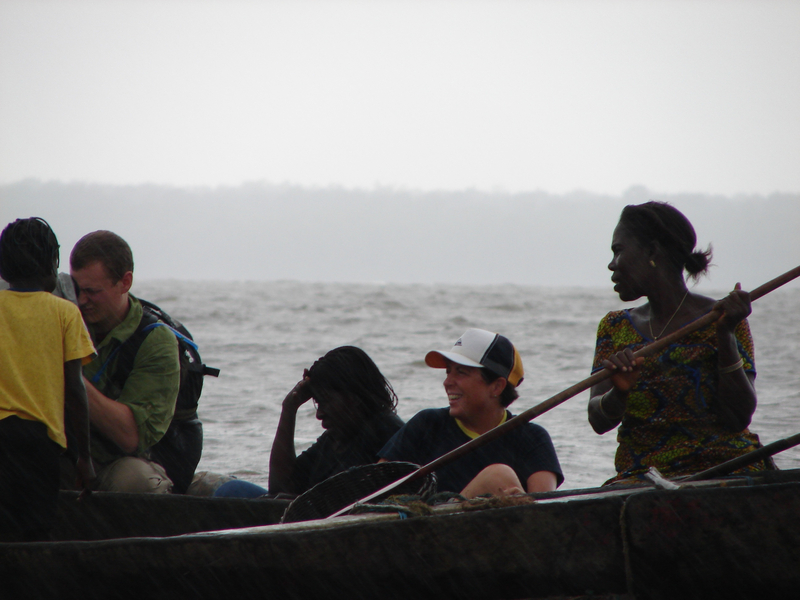 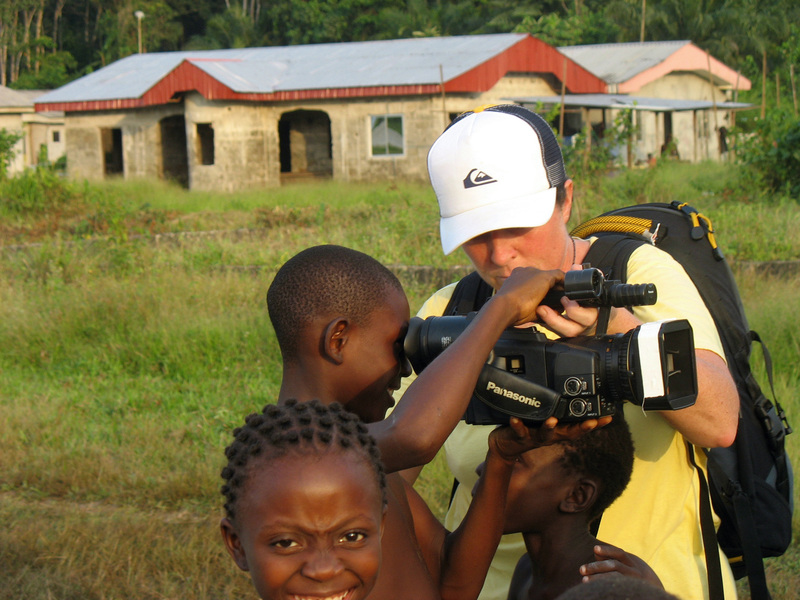 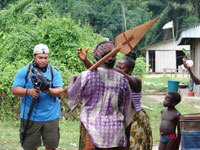 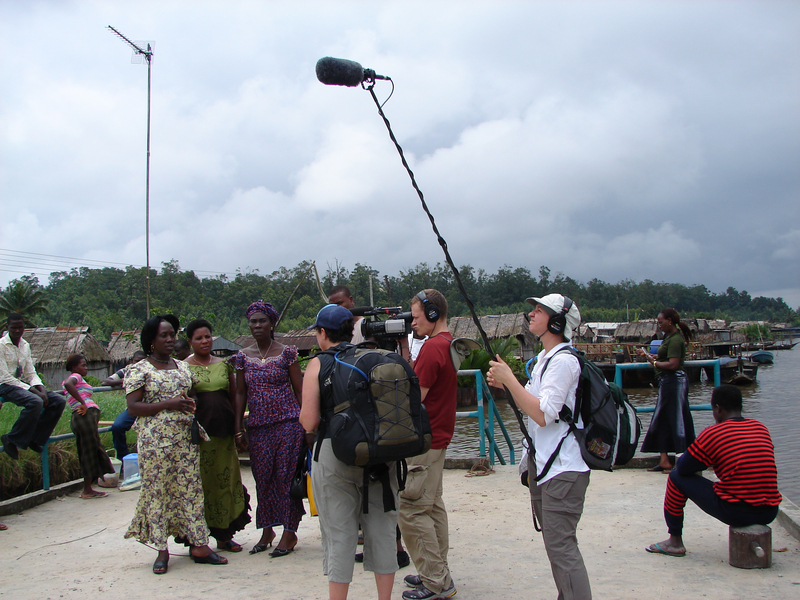 Director Sandy Cioffi with village kids, Oporoza, Niger Delta, August 2006.
l to r: Oporoza villager Sandra, cinematographer Sean Porter, journalist Ibiba Don Pedro, director Sandy Cioffi and women’s leader Helen Lelekumo during filming on the Niger Delta waterways, August 2006.
l to r: Niger Delta women leaders Fanty, an unidentified resident and Helen with director Sandy Cioffi, cinematographer Sean Porter and unit soundperson Laurie Hicks, Niger Delta, August 2006.
l to r: Cameraman Cliff Worsham films Oporoza resident Janet setting off to fish, one of two daily trips that typically do not yield enough to feed her family, Oporoza, Niger Delta, August 2006. 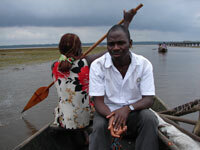 There are no roads in the Creeks area of the Niger Delta; village residents must paddle everywhere. Gas flare and oil installation in background. Oporoza, Niger Delta, August 2006.
l to r: Oporoza resident Cynthia and student leader Timi on the waterways, Oporoza, Niger Delta, August 2006. 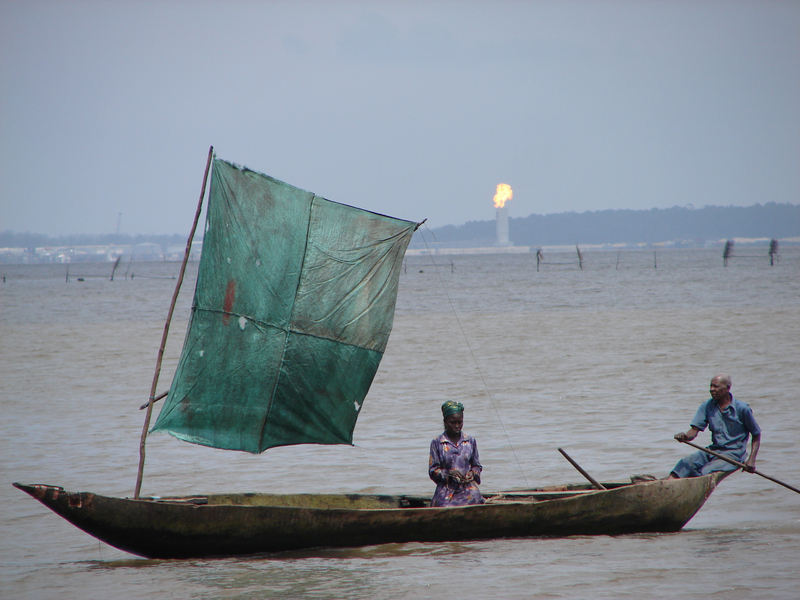 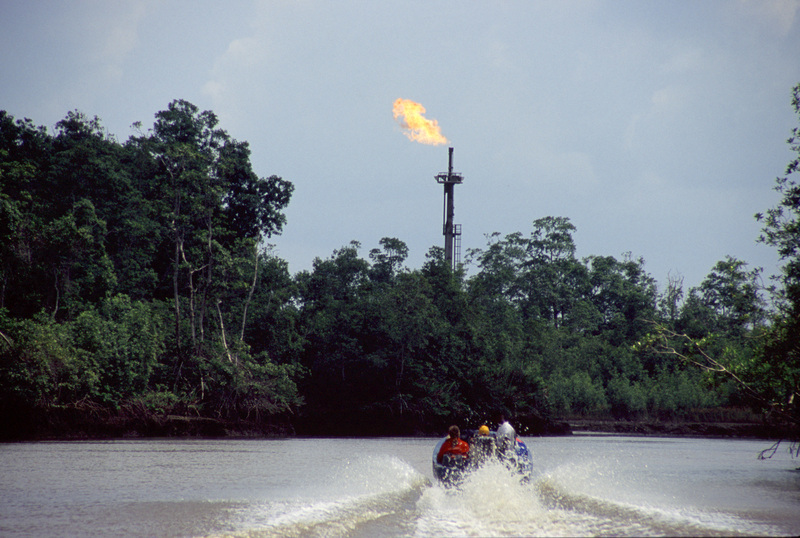 A boat speeds through the “creeks” of the Niger Delta, as one of the ubiquitous gas flares looms, Niger Delta, November 2005. 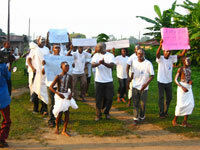 National Association of Gbaramatu Students members hold a rally demanding resource control for the people of the Niger Delta, November 2005.